Figure 1. Pearly papular lesions and an inflamed lesion on the patient’s left thigh. Figure 2. Skin biopsy demonstrating a central crater filled with viral bodies and early viral inclusions developing in surrounding keratinocytes. Over a six-month period, a 9-year-old boy developed on his thighs and pubic area a progressive number of 2 to 4 mm diameter pearly papules, some of which had a small central dimple. 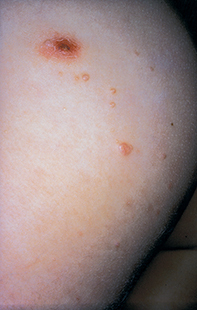 The papules were focally aggregated, and one lesion was obscured by an inflammatory reaction (Figure 1). Skin biopsy of the papule revealed an epithelium-lined canal containing numerous eosinophilic bodies that appeared to develop within the surrounding keratinocyte lining (Figure 2). Papular lesions on the thighs may represent a series of conditions. Warts usually have a verrucous surface, but may be small and flat-topped when they are plane warts. 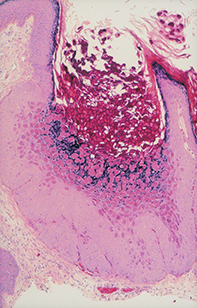 Skin biopsy shows an increased granular layer within the epidermis and small viral inclusions as well as vacuolated keratinocytes (koilocytes). Immunoperoxidase stains for human papillomavirus can be used to demonstrate the presence of wart virus in paraffin sections. Opportunistic infection can present as small, pale papules in immunocompromised patients. Deep fungal infection such as cryptococcus or aspergillosis may be present; skin biopsy as well as cultures are required for diagnosis. These lesions are often more widespread and may occur on the face. Lichen nitidus is an uncommon skin condition characterised by 1 to 2 mm diameter aggregated shiny papules that may be flesh coloured. Skin biopsy demonstrates focal lymphocytic inflammation with histiocytes that hug the epidermis. Molluscum contagiosum is the correct diagnosis in this case. It is caused by a DNA poxvirus with an affinity for skin. The clinical presentation of firm, umbilicated, pearly papules usually allows the diagnosis without any need to biopsy. Material may, however, be obtained by curettage or by using a needle to avulse the central molluscum bodies. Marked inflammatory lesions may masquerade as a folliculitis or a dermatitis. Widespread lesions may develop in immunosuppressed individuals. Molluscum contagiosum may undergo spontaneous involution, but treatment is preferable because a small number of lesions may multiply and can be readily transmitted to other family members. Avulsion of the molluscum bodies with a needle or sharp curette is the most frequent method of treatment. Topical retinoids or salicylic acid creams have limited success. Cryotherapy may be tolerated in adults and can be used for localised lesions. Topical 5% imiquimod applied daily for four weeks has been successfully used in children. Initial trials using cidofovir (approved for the treatment of cytomegalovirus) incorporated into a 1% cream have shown promising results. Pulsed dye laser has also been used to destroy molluscum lesions with an excellent therapeutic outcome. Molluscum contagiosum can usually be diagnosed clinically because of its characteristic pearly, umbilicated, firm papules, which are often grouped. This article was first published in Medicine Today in September 2003. It was reviewed and updated in November 2012.